These are small-group band lessons that teach jazz improvisation and small-ensemble playing techniques in a band setting. Students learn as they play real jazz music in a band. 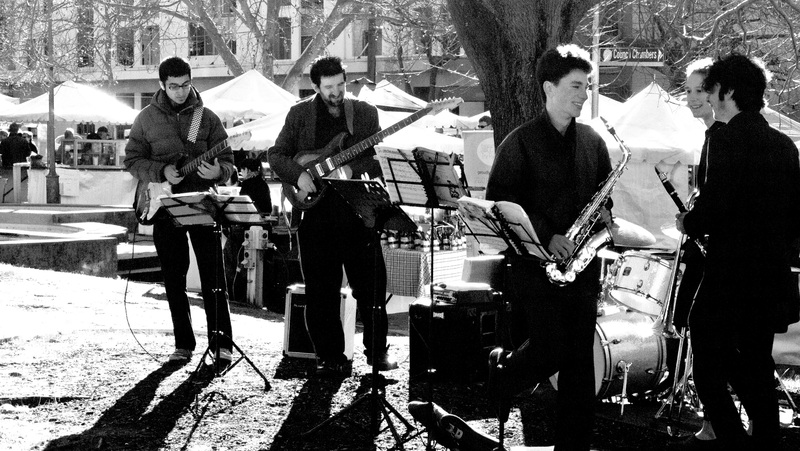 A jazz combo is a small band, of up to ten musicians. It is really a flexible “combination” of instruments. There are groups for all ages and levels, on Saturdays and mid-week. Places are limited to eight people per band. A combo can involve any “combination” of instruments, there are no set parts. All combos besides the introductory adult course are by audition/assessment to ensure students are placed in the right group for them. JWA Academy Combos (audition only) & Adult Combo II (audition only) $737/ semester (18 sessions plus concert). Semester 1 is February 9 – June 29. The groups are led by JWA principal Saul Richardson or Gavin Ahearn with occasional guest tutors. Contact us now to enrol. What are the benefits of playing in a jazz combo? Combos give you the chance to apply and put into practice the work and theory you learn with your teacher, and really give your playing a boost. This is an excellent way to dramatically improve your skills on your instrument, and to boost your self confidence. Just as the kids who do swimming squad or little athletics always seem to win the races at school, kids who take combo and/or improvisations lessons tend to become the “star” jazz players at school, or just enjoy music more! Contact us now to join a combo.